During the second session of the Thirteenth National People's Congress of Guangdong Province this year, a number of representatives of the provincial People's Congress from the Shantou Delegation submitted proposals, requiring to transform and improve Shantou Railway Station's facilities and strengthen its passenger capacity and service level. On the morning of March 28, the provincial people's congress received an official reply from China Railway Guangzhou Group, stating that it will transform the relevant facilities of Shantou Railway Station according to the representatives' proposals, add escalators and solve other issues of public concern, so as to provide better service for public travel. China Railway Guangzhou Group said in its reply that Platform 1 of Shantou Railway Station will be elevated and transformed, and Tracks 1 and 2 will be added with suspension catenary to meet the parking requirements of EMUs, so as to enhance Shantou Railway Station's transportation capacity and contribute to increasing the frequency of train operation. Corresponding escalators will be added to the underground passage which passengers are most concerned about. In combination with the promotion of railway electronic ticket, ticket picking machines will be added when the timing is proper. 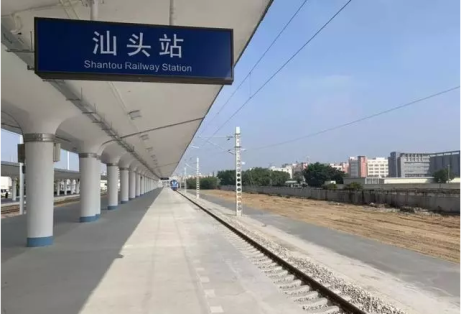 In addition, in weekends, holidays and other peak periods, it will further adjust and optimize the train stop and running time, take measures such as raising the number of EMU trains, organizing EMU re-connection, so as to further increase the transportation capacity of Shantou Railway Station.